What can be said about the value of an observable during the time interval between two measurements ? A possible answer to this question has been given by Aharonov, Albert and Vaidman (AAV) in 1988. In their seminal paper “a new kind of value for a quantum variable” the so-called weak value is introduced, again demonstrating that quantum mechanics predicts striking and astonishing counter-intuitive phenomena. The weak value is obtain via a procedure, referred to as weak measurement, where the probed quantum system is left minimally disturbed and pursues its evolution from an initial state towards its final state. The weak value of a variable may differ significantly from the eigenvalues of an associated operator in that sense, that weak values may lie far outside the eigenvalue range of the operator. In our latest neutron optical experiment we investigate the paths taken by neutrons in a three – beam interferometer. In various beam-paths of the interferometer, the energy of the neutrons is partially shifted so that the faint traces are left along the beam-path. Which-path information is extracted from these faint traces with minimal-perturbations. Theory is derived by simply following the time evolution of the wave function of the neutrons, which clarifies the observation in the framework of standard quantum mechanics. Which-way information is derived from the intensity, sinusoidally oscillating in time at different frequencies, which is considered to result from the interfering cross terms between stationary main component and the energy-shifted which-way signals. 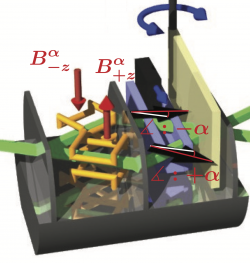 Final results give experimental evidence that the partial wave functions of the neutrons in each beam path are superimposed and present in multiple locations in the interferometer. 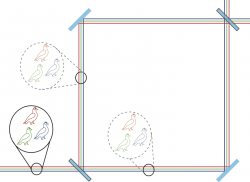 The pigeonhole effect principle tells us that if you put n items are put into m containers, with n > m, then at least one container must contain more than one item. However in quantum mechanics this basic property does not hold. 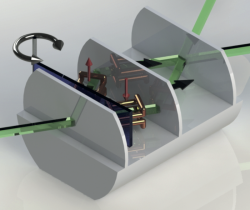 This violation of the classical effect is referred to as quantum pigeonhole effect and is demonstrated in our neutron interferometric experiment. We developed a measurement scheme, used in a matter-wave interferometric experiment, in which the neutron path system’s quantum state was characterized via direct measurements using both strong and weak interactions. Experimental evidence is given that strong interactions outperform weak ones for tomographic accuracy. Our results are not limited to neutron interferometry, but can be used in a wide range of quantum systems. The Cheshire Cat featured in Lewis Caroll’s novel “Alice in Wonderland” is a remarkable creature: it disappears, leaving its grin behind. Can an object be separated from its properties? It is possible in the quantum world. In our experiment, neutrons travel along a different path than one of their properties – their magnetic moment. 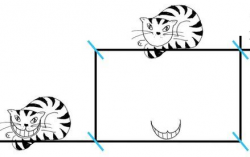 This is the “Quantum Cheshire Cat”. 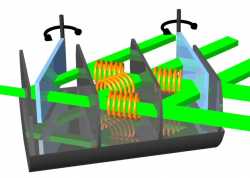 A straightforward implementation of weak measurements for massive particles, as originally proposed by Yakir Aharonov, is not feasible, due to the tiny coherence volume of particles used in matter-wave optics. We have overcome this hurdle by developing a method to weakly measure a massive particle’s spin component. This is achieved in a neutron optical approach by utilizing neutron interferometry, where the neutron’s spin is coupled weakly to its spatial degree of freedom.